100 feet of premade CAT6 network cabling with molded booted RJ45 connector tips that are already on the ends so you don't have to crimp them on. This cable is made out of solid copper CAT6 wire so you will get the best possible data signal. Great for use indoors or in a conduit where the cable is protected from water. The booted network RJ45 connectors prevent accidental wire disconnections. 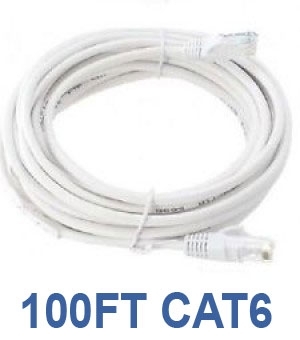 CAT6 cable is traditionally needed in network applications that require the high bandwidth of Gigabit connections. As concerns IP security camera systems and use of ip cameras, CAT6 cable is mainly needed for the thicker 23 gauge wire inside which carries currents over PoE connections better than 24 gauge CAT5e wire. For IP cameras with high wattage requirements, this CAT6 solid copper cable is the best possible structured cabling option to power the cameras. If you are looking for longer cables or are a Pro at making cables, then be sure to checkout our great prices on 1000ft CAT6 Wire.